K Jazz FM America’s #1 Jazz & Blues Station. K Jazz FM (K Jazz 88.1 MHz FM) is a non-commercial public radio station in Southern California broadcasting from the Long Beach State campus. 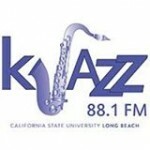 The station is one of the several public radio stations in Southern California presenting jazz and blues.